AUGUSTA, Ga. — Winning has always fueled Tiger Woods. Even when he stood on a small makeshift podium under the Bahamian sun and fielded a handful of questions on a November Thursday in 2017, he couldn’t help himself. Begin Scene One. It was his first start following a fourth back surgery, a DUI and in-patient treatment for prescription drugs and inevitable self-doubt. He had more money that he’d ever be able to spend, 14 major titles and one of the most storied professional careers in the game. That Thursday was the first start of his rest of his life, his next chapter — all that jazz. Posting a number didn’t seem important. Winning? Forget winning. What about four healthy rounds? But Woods wasn’t ready to go there, dammit. He was sniffing contention. “It was not only nice to get the first round out of the way, but also — I’m only three shots out of the lead,” he said. 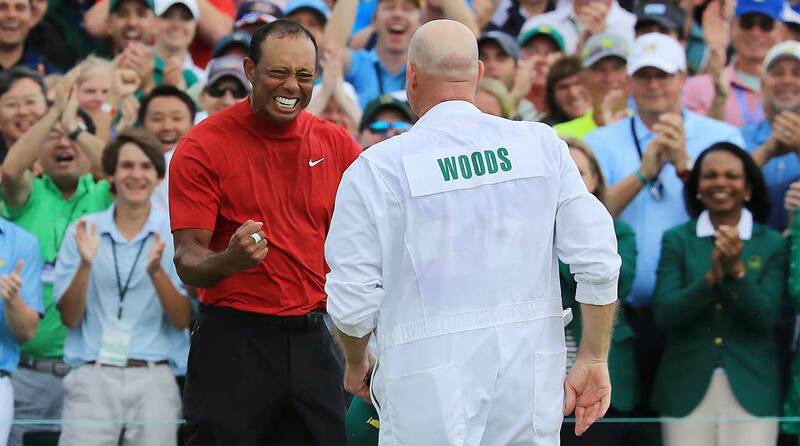 Tiger Woods and caddie Joe LaCava celebrate Woods's Masters victory. Now, Scene Two: 17 months later, at 2:30 p.m. local time, behind the 18th green at Augusta National Golf Club. Woods is bear-hugging his son, his daughter, his mom, his manager, his girlfriend and his agent. Of course he won the Tour Championship last fall but that was — apologies, Tiger — a 30-man field. This is the Masters. Fifteen majors and counting. Fist-bumps were flying. Beers spilled. Grown men cried. Woods’s primal screams echoed through the hallowed grounds. Tiger! Tiger! Tiger! the crowd chanted, again and again. Woods raised his left hand in the air and put his right hand on the back of his son, Charlie, who was decked out in Nike gear, just like his dad. They walked through a sea of spectators, and when they emerged on the other side, Woods threw both arms high into the air. Woods’s start at the Hero World Challenge was the preamble to this latest chapter. He’s had comebacks before. They never took. This one has. But Woods never stopped believing. He knew he could win if he got his body back, his swing back, his health back. Back to Scene One, the Hero in 2017. The Hero was not then and still is not an official event. It’s a glorified exhibition with a goofy trophy, but after a Friday 69 Woods was five back with 36 holes to play. But this wasn’t about prestige; this was about baby steps. But not Woods. As he left the press scrum he was asked if he could win. He turned and smiled.